Histones are the main constituents of the protein part of chromosomes of eukaryotic cells. They are rich in the amino acids arginine and lysine and have been greatly conserved during evolution. Histones pack the D into tight masses of chromatin. Two core histones of each class H2A, H2B, H3 and H4 assemble and are wrapped by 146 base pairs of D to form one octameric nucleosome. Histone tails undergo numerous post-translatiol modifications, which either directly or indirectly alter chromatin structure to facilitate transcriptiol activation or repression or other nuclear processes. In addition to the genetic code, combitions of the different histone modifications reveal the so-called "histone code". Histone methylation and demethylation is dymically regulated by respectively histone methyl transferases and histone demethylases. Acetylation of histone H2B is associated with active genes. ChIP assays using HeLa cells: ChIP” kit on sheared chromatin from 10,000 cells using the SX-8G IP-Star automated system. A titration of the antibody consisting of 1, 2, 5, and 10 ug per ChIP experiment was analysed. IgG (5 ug/IP) was used as negative IP control. 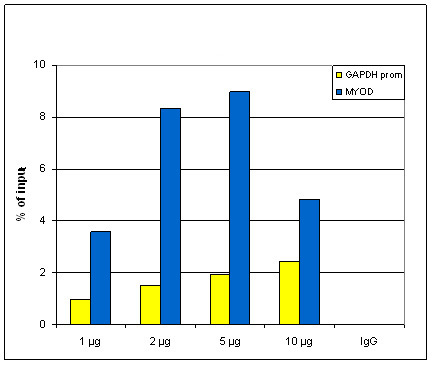 QPCR was performed with primers for the GAPDH promoter and for the inactive MYOD gene. Image shows the recovery, expressed as a % of input (the relative amount of IP'd DNA compared to input DNA after qPCR analysis). Determination of the titer To determine the titer of the antibody, an ELISA was performed using a serial dilution of the antibody against H2Bpan , crude serum and flow through in antigen coated wells. By plotting the absorbance against the antibody dilution (Figure 2), the titer of the antibody was estimated to be 1:14,950. 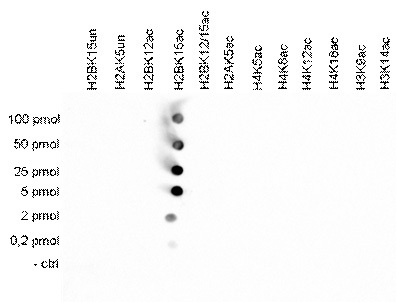 A Dot Blot analysis was performed to test the cross reactivity of the antibody against H2Bpan with the peptide used for immunization of the rabbit and other peptides containing unmodified sequences of different histones. One hundred to 0.2 pmol of the respective peptides were spotted on a membrane. The antibody was used at a dilution of 1:20,000. 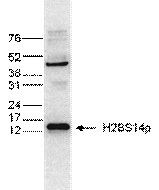 Image shows a high specificity of the antibody for the H2B peptide. 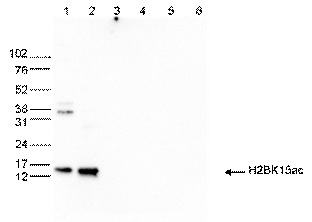 WB was performed on whole cell (25 ug, lane 1) and histone extracts (15 ug, lane 2 ) from HeLa cells, and on 1 ug of recombinant histone H2A, H2B, H3 and H4 (lane 3, 4, 5 and 6, respectively) using the antibody against H2BK12ac. The antibody was diluted 1:1,000 in TBS-Tween containing 5% skimmed milk. The marker (in kDa) is shown on the left. ChIP assays using HeLa cells (sheared chromatin from 1.5 million cells). 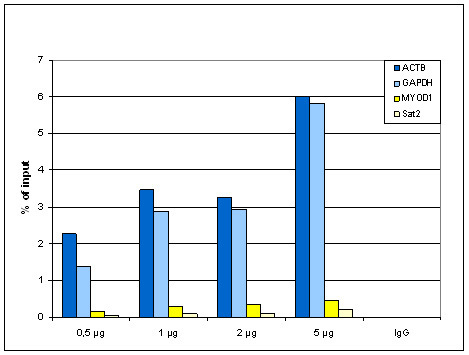 Titration of 0.5, 1, 2 and 5ug antibody per ChIP was analysed. IgG (1 ug/IP) was used as negative control. qPCR primers were for a region ~1kb upstream of GAPDH and ACTB promoters as positive controls, and for the coding region of inactive MYOD1 gene and Sat2 satellite repeat as negative controls. Image shows the recovery, expressed as a % of input (the relative amount of IP'd DNA compared to input DNA after qPCR). ChIP was performed on sheared chromatin from 1.5 million HeLaS3 cells using 0.5 ug antibody. The 51 bp tags were aligned to the human genome using the BWA algorithm. 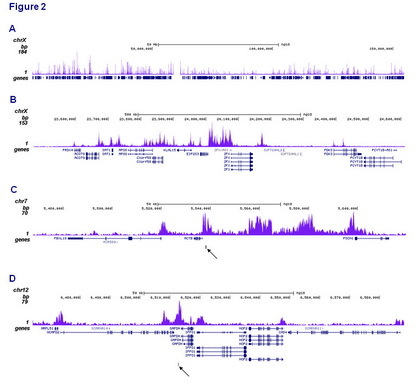 Image shows the enrichment along the complete sequence and a 1Mb region of the X-chromosome (A and B) and in genomic regions of chromosome 7, surrounding ACTB gene, and of chromosome 12, surrounding GAPDH gene (C and D). The position of the amplicon used for ChIP-qPCR is indicated by arrow. Determination of the antibody titer To determine the titer of the antibody, an ELISA was performed using a serial dilution of the antibody against H2BK12ac in antigen coated wells. The antigen used was a peptide containing the histone modification of interest. 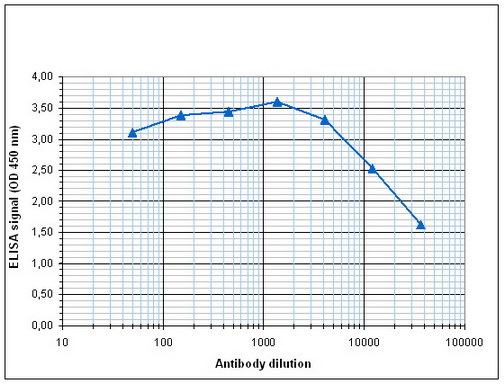 By plotting the absorbance against the antibody dilution (Figure 3), the titer of the antibody was estimated to be 1:38,200. A Dot Blot analysis was performed with peptides containing other histone modifications and the unmodified H2B. One hundred to 0.2 pmol of the respective peptides were spotted on a membrane. The antibody was used at a dilution of 1:5,000. Figure 4 shows a high specificity of the antibody for the modification of interest. 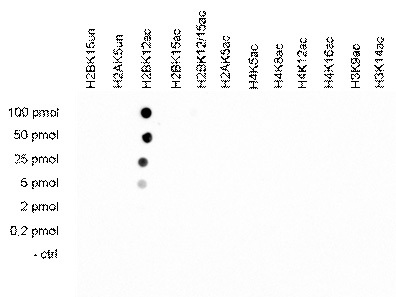 WB was performed on whole cell (25 ug, lane 1) and histone extracts (15 ug, lane 2 ) from HeLa cells, and on 1 ug of recombinant histone H2A, H2B, H3 and H4 (lane 3, 4, 5 and 6, respectively) using the antibody against H2BK15ac. The antibody was diluted 1:500 in TBS-Tween containing 5% skimmed milk. The marker (in kDa) is shown on the left. ChIP assays using HeLa cells (sheared chromatin from 1.5 million cells). 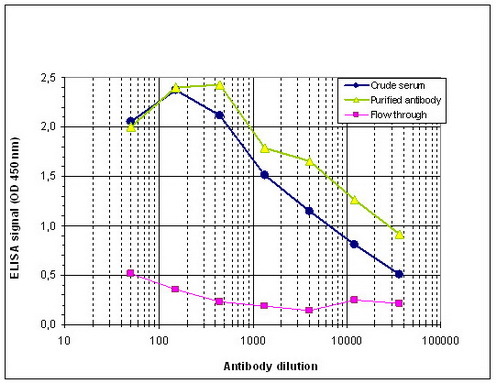 Titration of 0.5, 1, 2 and 5 ug antibody per ChIP was analysed. IgG (1 ug/IP) was used as negative control. 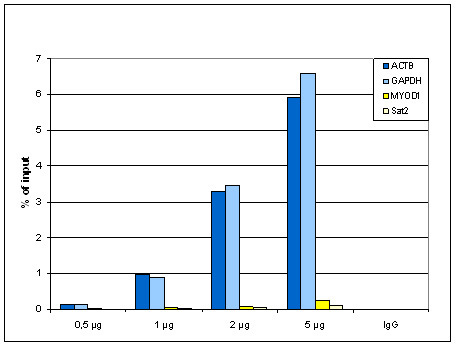 qPCR primers were for a region ~1 kb upstream of GAPDH and ACTB promotersas positive controls, and for the coding region of the inactive MYOD1 gene and the Sat2 satellite repeatas negative controls. Image shows the recovery, expressed as a % of input (the relative amount of IP'd DNA compared to input DNA after qPCR). ChIP was performed on sheared chromatin from 1.5 million HeLaS3 cells using 2 ug antibody. The 51 bp tags were aligned to the human genome using the BWA algorithm. 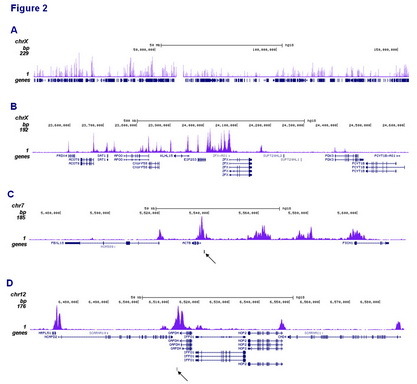 Image shows the enrichment along the complete sequence and a 1 Mb region of the X-chromosome (A and B) and in genomic regions of chromosome 7, surrounding the ACTB gene, and of chromosome 12, surrounding the GAPDH gene (C and D). The position of the amplicon used for ChIP-qPCR is indicated by an arrow. Determination of the antibody titer To determine the titer of the antibody, an ELISA was performed using a serial dilution of the antibody against H2BK15ac in antigen coated wells. The antigen used was a peptide containing the histone modification of interest. 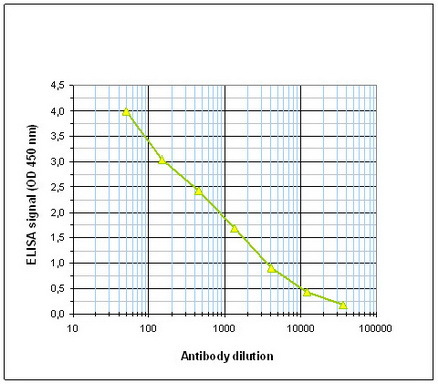 By plotting the absorbance against the antibody dilution (Figure 3), the titer of the antibody was estimated to be 1:29,700. 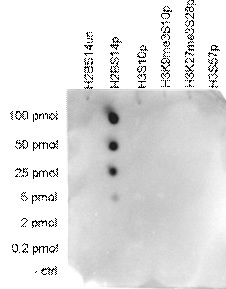 A Dot Blot analysis was performed with peptides containing other histone modifications and the unmodified H2B. One hundred to 0.2 pmol of the respective peptides were spotted on a membrane. The antibody was used at a dilution of 1:20,000. Figure 4 shows a high specificity of the antibody for the modification of interest. 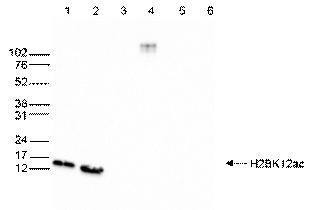 WB using the antibody against H2BS14p diluted 1:200 in TBS-Tween containing 5% skimmed milk. The position of the protein of interest is indicated on the right; the marker (in kDa) is shown on the left. Determination of the antibody titer To determine the titer of the antibody, an ELISA was performed using a serial dilution of the antibody against H2BS14p.The antigen used was a peptide containing the histone modification of interest. 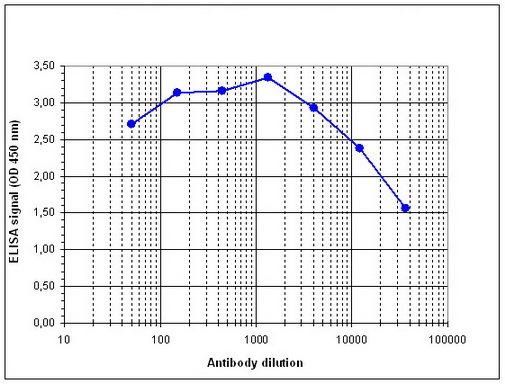 By plotting the absorbance against the antibody dilution (Figure 1), the titer of the antibody was estimated to be 1:2,000. 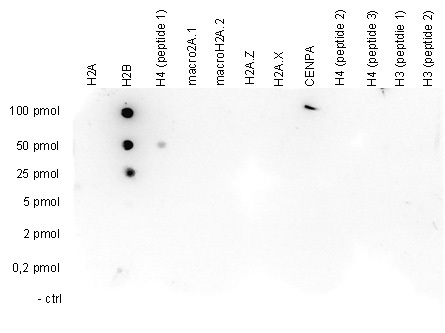 A Dot Blot analysis was performed with peptides containing other histone phosphorylations and the unmodified H2BS14. One hundred to 0.2 pmol of the respective peptides were spotted on a membrane. The antibody was used at a dilution of 1:2,000. Image shows a high specificity of the antibody for the modification of interest.